Axton Finance are an established mortgage broker based in Hawthorn East, Melbourne. With a business built on trust, confidence and professional expertise, Axton Finance service a wide range of clients with a focus in residential finance solutions. A boutique firm, offering a more personal and bespoke service offering, Axton Finance wanted to capitalise on their key points of difference: a small but professional firm - not a big city firm in a glass tower - with consistent point of contact for customers, an independent operator not part of a chain, and a strong focus on providing a high level of personalised customer service. With lead generation a key focus, measurable return on investment (ROI) was crucial. Axton Finance understood that a strategy-led engagement was the best way to ensure that the website was fit for purpose and focused on delivering quality leads, rather than simply volume. We designed and developed a website with a strong aesthetic and a focus on articulating delivering a high quality service to customer needs. The existing Axton Finance website had provided the business with a digital presence for minimal investment. However, it was not well-equipped to support Axton Finance’s business objectives for growth. In order to place the business in a stronger position to be able to increase traffic, and in turn leads and conversions, and further grow the business, Evolution 7 proposed a redevelopment of the website. The end result was the creation of a modern and lead-orientated website, optimised for conversion; with a complimentary digital marketing plan to deliver high-quality leads to the business. 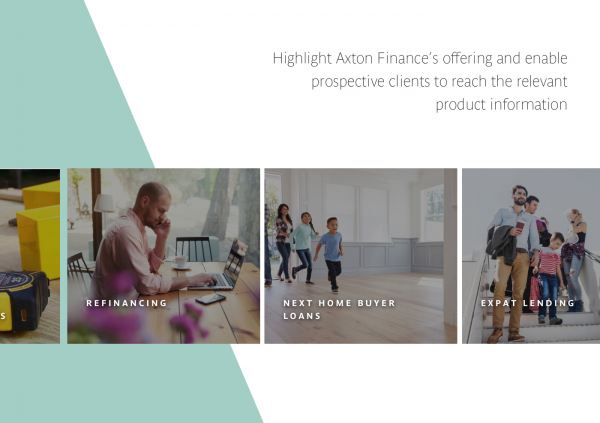 Axton Finance’s previous website had a number of limitations preventing it from being a valuable digital marketing asset - with no real journeys from the homepage and limited product pages, it struggled with engagement and traction with key market segments. As a result, it was serving the business as more of a validation step rather than as a marketing tool, with the majority of leads being generated through referral. Axton Finance wanted to broaden their marketing efforts, reduce the reliance upon a few key channels, and generate more high quality opportunities per month through digital channels. 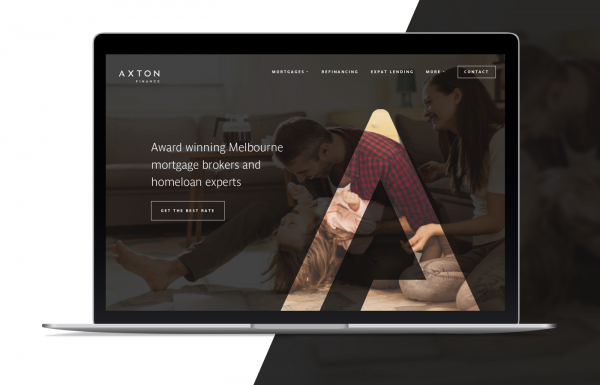 The redevelopment of the Axton Finance website was a key plank in the reinvigoration and broadening of Axton Finance’s marketing efforts. 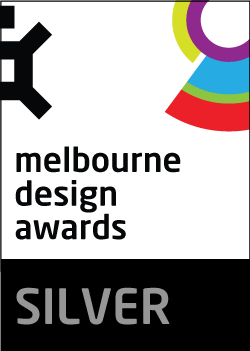 Led by a strategic vision for the place of digital in the marketing strategy, the website development was coupled with a measurement plan and the implementation of a custom tracking schema, to ensure ongoing data-driven decision making. The site is optimised for SEO, and the process included keyword research, identifying opportunities and market niches where Axton Finance could leverage existing performance. Content production and copywriting ensured consistency in tone of voice. The offline sales efforts are supported with an integration between the various enquiry and contact forms with a CRM; ensuring all leads are contacted in a consistent and prompt manner, and that the offline experience aligns with the digital experience. The Axton Finance team had developed a strong reputation based on quality outcomes for clients, high-end customer service, and a relationship of trust they develop with clients. The had also developed deep knowledge and expertise in some specific financial products and services. The new website and marketing strategy needed to highlight these aspects of Axton Finance’s offering, and quickly enable prospective clients to reach the relevant product information, and make enquiring an easy and straightforward step. Despite the limitation of the previous website, Axton Finance had some services and content which performed extremely well for the business, and retaining SEO positioning was a key requirement. The first step in the redevelopment project was a deep dive into business and customer data, and review of existing website analytics. This led into the development of user journeys, ensuring that the resulting website supported the movement of key audiences through the website to undertake calls to action. The development of the site architecture followed this analysis. We understood that engaging a mortgage broker and commissioning financial services often requires in-depth consideration, and most importantly, a high degree of trust needs to be established. 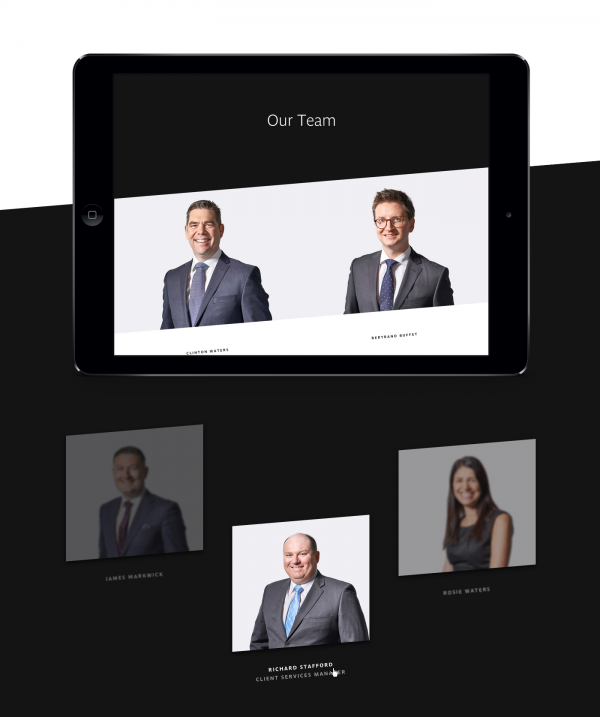 Our in-house content production and copy development focused on a conversational, personable and trustworthy tone of voice; supported by the use of social proofing techniques, such as testimonials, photography of the Axton Finance team and office, and display of recognised lender logos. 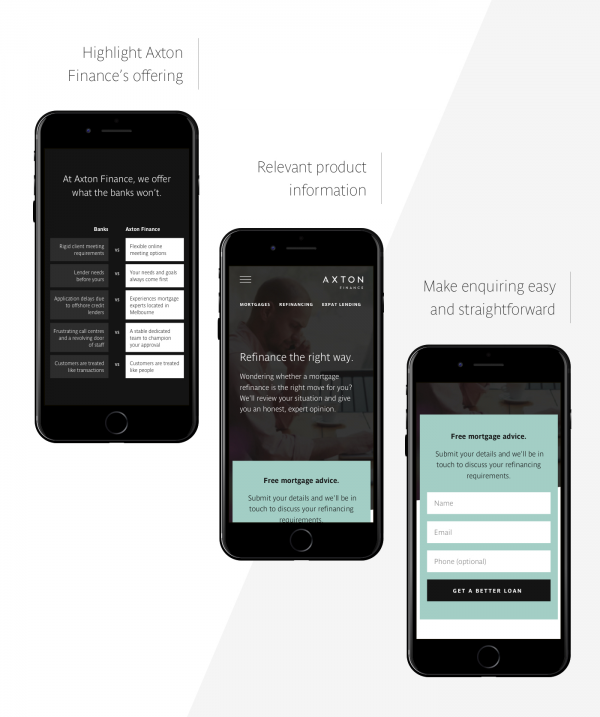 Quickly conveying the difference between Axton Finance and a bank was key: the use of interactive elements on the homepage and product/service pages neatly juxtapose the type of service quality and expertise Axton Finance is known for, with the equivalent service levels of larger financial organisations. Lastly, each product/service page has a enquiry call to action and form, with minimal fields, and crafted copy unique to each page. This makes it as easy as possible for a prospective client to get in touch without needing to hand over too much personal information.